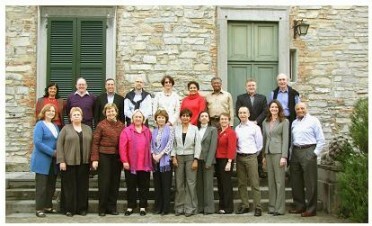 In order to advance civic engagement in higher education, the Talloires Network brought together 20 higher education leaders at the Rockefeller Foundation’s Bellagio Conference Center in Italy for a unique discussion about the agenda for this important global movement. The network convened the conference, “Higher Education Responding to Social Needs,” from March 23-26, 2010 to discuss key issues including new ways of engaging students, faculty, and policymakers; how best to measure and communicate the importance and value of higher education civic engagement; and the relationship of the global Talloires Network with its regional partners around the world. One of the key goals of the Bellagio Conference was to share information about different regional contexts for higher education civic engagement and to discuss the relationship between the global Talloires Network and its regional partners. Representatives from our regional partners from around the world presented on their local context, focusing on the opportunities and challenges for implementing civic engagement in higher education. Russel Botman, Rector and Vice-Chancellor of Stellenbosch University in South Africa presented “Hope in Africa: Human development through higher education community interaction.” View the presentation. Yazmin Cruz, Project Manager, Global University Network for Innovation (GUNI), presented on GUNI’s work worldwide. View the presentation. Saran Kaur Gill, Deputy Vice-Chancellor for Industry and Community Partnerships at the Universiti Kebaangsan Malaysia: “Engagement in Higher Education in Malaysia and South East Asia.” View the presentation. Piyushi Kotecha, CEO of the Southern African Regional Universities Association (SARUA): “Civic Engagement and Social Development,” focusing on the regional context in southern Africa. View the presentation. Jan Reid, Vice-Chancellor of the University of Western Sydney: “Australia: Civic Engagement in Higher Education.” Read the presentation. Maria Nieves Tapia, Director of the Latin American Center for Service-Learning (CLAYSS): “Higher Education Community Engagement in Latin America.” View the presentation.